As digital marketers prioritize audience and follower engagement via social media channels, today, Easypromos, a global leader in digital promotions, announced the launch of its new multi-language platform, enabling its Facebook contests, sweepstakes, quizzes and more to be tailored to any one of thirty languages across every social media channel and mobile device. The new platform is in answer to the increasing demand by digital marketers for tools to engage with audiences in multiple languages, particularly important for companies and brands within the travel and leisure industry, as well as multi-national corporations and celebrities and figureheads with a global following. Historically, administrators would have to create separate promotions for each language as well as separate corresponding communication, and separate response databases, making the manual process time consuming and burdensome. Now, administrators will not only be able to tailor the entire interface of the promotion according to the preferred language of multiple audiences, but match corresponding communications such as registration, the promotion landing page, social media sharing and auto-email responses, which will automatically adjusted according to the participant’s language set on their browser. Further, for each language, administrators will have access to a complete editor allowing translation of all texts and images for the promotion. The editor shows the texts configured in the primary language first, but administrators can navigate between different screens, view pending translations and review all texts before publishing. Easypromos is a global leader in social media promotions offering a self-service, easy-to-use platform to create and manage digital campaigns seamlessly across any social media network or device. Launched in 2010, Easypromos has powered digital campaigns supporting contests, sweepstakes, quizzes, surveys, and more through simple, customizable solutions that are easily shareable for more than 250,000 promotions worldwide. 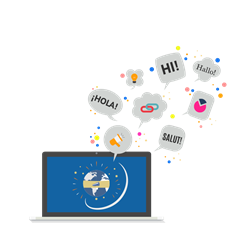 Clients span 50 countries, with promotions running in 24 languages. Members of the media can contact Emily Porro at media@easypromosapp.com.